Cherries on the tree; photo by Nadee Talagala on Flickr (noncommercial use permitted with attribution / no derivative works). Both sweet and tart cherries are grown in Utah. 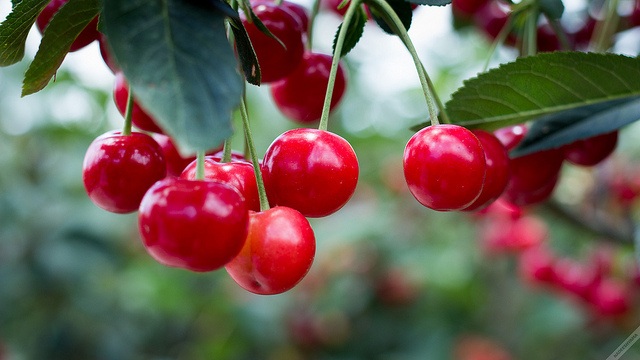 Utah is the second largest tart cherry producing state in the nation, and fifth in the nation in the production of sweet cherries (no other state ranks in the top five in both categories). 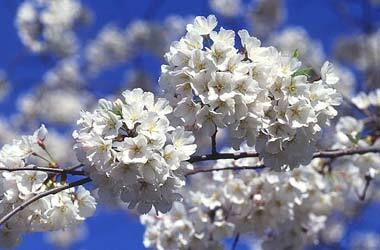 About 2 billion cherries are harvested yearly and about 4,800 acres of agricultural land is used for cherry production. The cherries are sold as fresh fruit, to canneries to make pies, brined as maraschino cherries, or dried. Cherry trees also surround the capitol building in Salt Lake City, sent to Utah as a gift by the Japanese after WWII as a symbol of friendship. Cherry Tree blossoms; photo by Scott Bauer from The Best Links.com: Cherry.